In 1915, New York’s Hippodrome Theatre hosted an ice spectacular, a whizzing, gliding ballet on a sheet of frozen water on the stage. There, Charlotte Oelschlägel, a 17-year-old skating prodigy from Germany known just by her first name, jumped and twirled her way into Broadway history. Hip Hip Hooray!, it was called, was among the first ice shows on Broadway and, for the better part of a year, enthralled audiences on the Great White Way. Ice skating had long been a beloved winter pastime in New York. Central Park’s skating pond was open to the public before the park itself was even completed, and throughout the 1860s, skaters took to iced-over waterways across the five boroughs. New York’s ice-skating history is the subject of a new exhibition that opens today at the Museum of the City of New York. “This exhibition provides a fascinating window into many different aspects of New York City life, including the history of popular culture and nightlife, the development of public parks, and the rise of Midtown Manhattan as an entertainment district,” says curator Frances Rosenfeld. It’s an unusual, overlooked lens through which to view New York history. 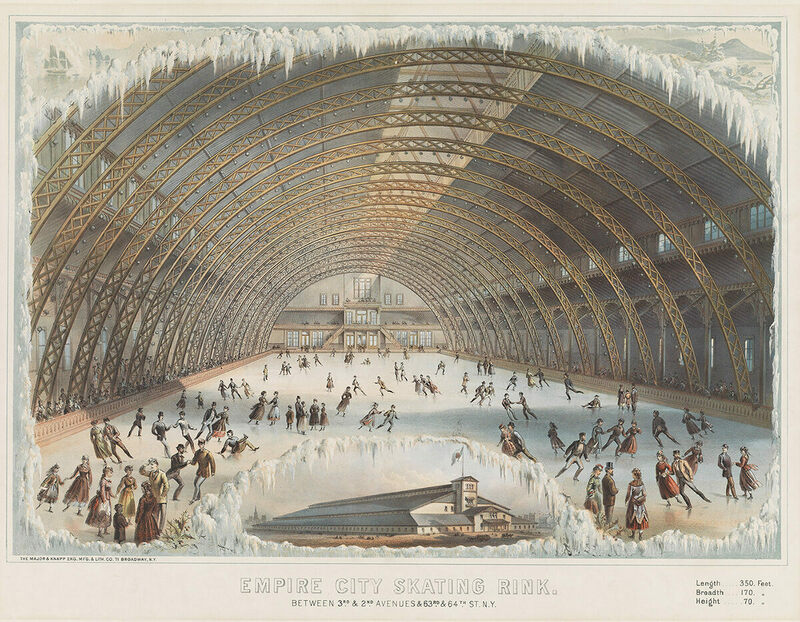 Take the now-demolished Empire City Skating Rink, which opened in 1868 on the Upper East Side. This behemoth—350 feet long with a 70-foot-high arched ceiling—attracted more than 3,000 people on its first day. Union Pond, which opened during the Civil War, was the first skating pond in Williamsburg, Brooklyn. It had a band every afternoon and evening, and frequent “displays of pyrotechnics,” reported The New York Times. It was also cleaned by horsepower, with chilly lodging for the employees: The stables were situated on the pond itself. Atlas Obscura has a selection of images from New York on Ice: Skating in the City, which is open through to April 15, 2018.